Coh&Co’s two-wheeled cargo bike is a true VeloSled. Be it for bringing the kids to school or to replace the ranch pickup, this bike is a hot piece of kit. A full carbon frame with Hokotol aluminium hardware, the wishbone suspension and tuneable steering angles combine to form the stiffest, toughest cargo machine on the market. Her name is Anna and she owns the road. Suspension and redundant cable steering keep her safe and comfortable without giving up on capacity or performance. Anna’s extralong 1200mm cargo rack can carry well over 100 kilos and provides ample room for a full-sized adult or a couple of kids while still providing room for the groceries. 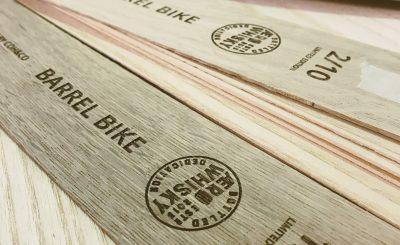 Join us in our workshop to meet the very first of the VeloSled carbon cargo bikes ‘Anna’. She is the lightest and toughest of the Coh&Co family as of yet and we are very exited to introduce her to friends of the house, old and new. We also have a newly produced batch of WOOCA bikes for you to take for a spin.